وجه العملة Helvetia with mountain peaked background. ظهر العملة The Swiss shield along with the coins 20 franc denomination. عملة ذهبية لسنة العشوائية لهيلفيتيا 20 فرنك سويسري Obtain a piece of history with a random year 20 Francs Helvetia Gold coin and enjoy the lowest price online! 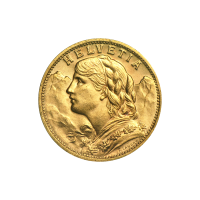 Minted between the years of 1837 and 1936, the Helvetia or “Swiss miss” is one of the most sought after coins on the market, due to its distinguished design exclusively in gold, and its historical value. 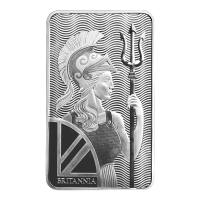 The obverse side of this coin displays Helvetia or the personification of Switzerland and her graceful beauty, designed by Fritz Landry. Helvetia is portrayed among the peaks of the many mountains that adorn her land. Above her head lies her title in bold lettering. The reverse side illustrates the Swiss shield with a vertically striped background, with leaves from an oak tree feature prominently behind. The coins denominational value and year of issue are also displayed. This coin remains a wise and highly liquid investment due to its gold content and historical significance. Diversify your holdings with this addition today!